A HOST OF agencies have warned people to be careful this weekend, as rain and wind are expected to hit over the weekend. Tonight and tomorrow are expected to receive the worst of the weather, with a risk of localised flooding. The Road Safety Authority says that those on the roads should take particular care. They advise drivers watch out for falling/fallen debris on the road and vehicles veering across the road, take special care when driving behind goods vehicles and allow extra space between you and vulnerable road users such as cyclists and motorcyclists. The Garda Síochána and Coast Guard both appealed to people to be careful. An Garda Síochána and Coast Guard particularly appealed to parents and guardians with children to use common sense and not to place their loved ones in danger. 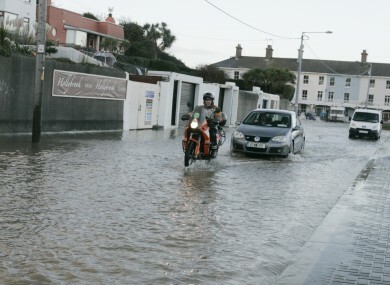 Coast Guard Chief of Operations Eugene Clonan said: “It is important for parents to be especially vigilant over the next few days and use common sense when taking children out near the coast or inland water ways”. Email “Driving or near water this weekend? Be careful”. Feedback on “Driving or near water this weekend? Be careful”.